Disclaimer: This is an entirely fan made project with the sole purpose of bringing back a few units that have been lost to the warp over the years. Any units that feature below are home-made and should only be used with the permission of your opponent. The models featured in this topic are based on Characters and Units that didn't make it into the Age of Sigmar Codex and use rules from existing Warscrolls to balance them out. This is a fun project and should never be considered official on any level and please do not think this is an opportunity for making hundreds of home-made units and expect them to be allowed! I recently started to help Kerry build an army of Bretonnians with the intention of getting involved in Age of Sigmar as it’s a much more casual game nowadays which I think we would both enjoy. In doing my research for Bretonnians, I realised just how lacking they were in terms of variety and was saddened to see just how many units and characters have been lost to the perils of the warp over the years. Therefore, I decided as a project to bring some of those units back into the new age. The realisation is, that Age of Sigmar offers a fantastic opportunity to bring back old units and characters in the form of Warscrolls because of its lack of points system. Before it was a case of trying to calculate how many points a character would be against how effective it is. Now however, it’s more a case of internal balancing of the character itself which is a lot easier. The units/characters below are based heavily on existing Warscrolls that were released by Games Workshop. 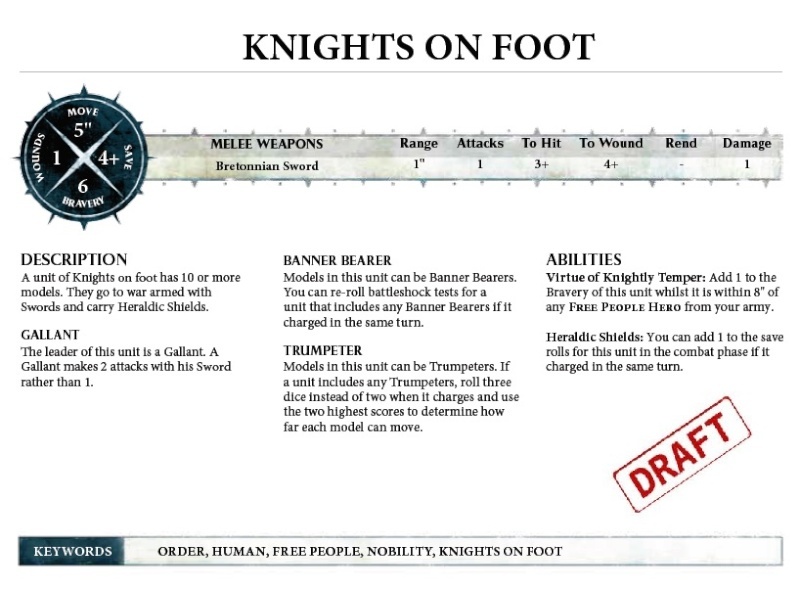 As an example, one of the units featured below is Foot Knights of the Realm. The Foot Knights have the exact same stats as the regular Knights of the Realm except they have had the Horses and Lances removed and their base number upped from 5 to 10. But you can read more about them later. By Comparison, I would use the Bretonnian Lord as an example: His stats are exactly the same whether he is riding a Pegasus or a Horse apart from the movement being higher and the Fly ability being used in the event he is riding the Pegasus. Please remember, these “home-made” Warscrolls are a work in progress and should never be considered official. If you decide to ever use these, please ensure your opponent is happy for you to do so. Movement changed from 10" to 5". Model count changed from 5 to 10. Reference to Lances and Horses removed. Knights on Foot were removed from the more recent army book for Bretonnians and their models are now OOP. Shame really as they added a lot of diversity to the range of miniatures and added to the historic value Bretonnians portray. Repanse is a very inspirational model in many ways. For one, she is a fantastic model with a real grasp of the Bretonnian style. Her background is also very cool in that she rose from a famer's girl working in a field, to a warrior leading an army against Chaos to save the Kingdom and becoming a knight in doing so. And also, because she was one of the first models Michael Perry made after his accident in which he lost an arm! Repanse De Lyonesse carries the following items: Sword of Lyonesse, the Fleur de Lys Banner and a shield. When designing the Fleur de Lys banner, I first looked at the old rules from White Dwarf 210 to see how it was intended to function. Originally it was designed to act as a regular Battle Standard with the additional rule that allowed it to remove one Winds of Magic card from their opponent. This of course is very out of date, but I see the intended purpose. So looking at the Bretonnian War Scrolls, I looked for some form of Anti-Magic as well as something that a Battle Standard does. The Relic Bearer rule seemed like the most logical choice for the Anti-Magic aspect of the banner as it states: Whilst any Relic Bearers stand, this unit can attempt to unbind one spell in each enemy hero phase as if it were a wizard. For the Battle Standard aspect, the logical choice is the Battle Standard the Paladin carries which is as follows: The Grail Banner: Add 1 to the Bravery of all Peasantry and Nobility units from your army within 15" of any Grail Banners. In addition, if the Paladin Standard Bearer slays a Monster or a Hero, then from that point onwards, Peasantry and Nobility units from your army within 15" of him do not need to take battleshock tests. I liked the +1 to Bravery aspect, because in the background for Repanse, she rallies the scattered Knights and leads them into battle. The second part however seems like too much, so I would take that out. Fleur de Lys Banner: Add 1 to the Bravery of all Peasantry and Nobility units from your army within 15” of the Fleur de Lys Banner. In addition, whilst the banner is in play, Repanse my attempt to unbind one spell in each hero phase as if she were a wizard. Fear isn’t really a special rule in Age of Sigmar, and I would rather her rules be more inspiring to her fellow Nobility than an offensive power against her enemies. Therefore I decided to keep the Courage of the Bretonni rule that already comes with the Bretonnian Lord and just renamed it to tie in with her character. Maidenly Halo: The power of the Lady of the Lake shines from Repanse like a Halo of light. Roll a dice whenever a Nobility model from your army flees within 10" of this model. On a 4 or more, that model returns to the fray and does not flee. 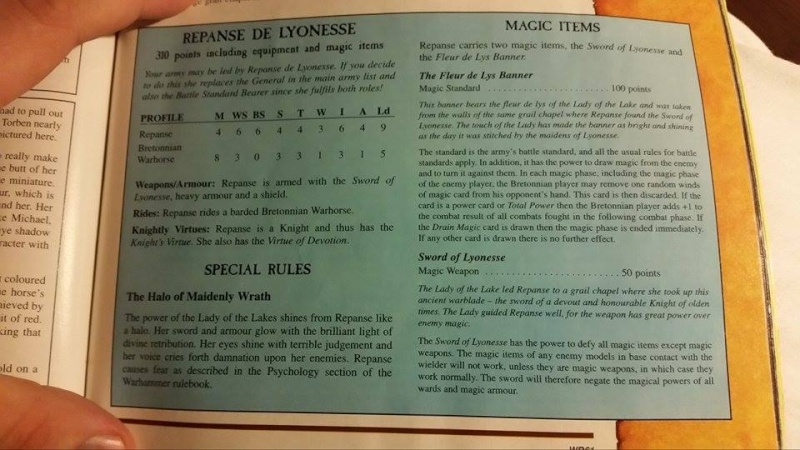 As it stands, the Sword of Lyonesse cancels the effects of Magic Items (Not Magic Weapons) in Close Combat but I feel this is too powerful in Age of Sigmar. Therefore, instead of having Dragonbane Lance and Ducal Shield as two items, I merged them together to create the Lyonesse Sword. 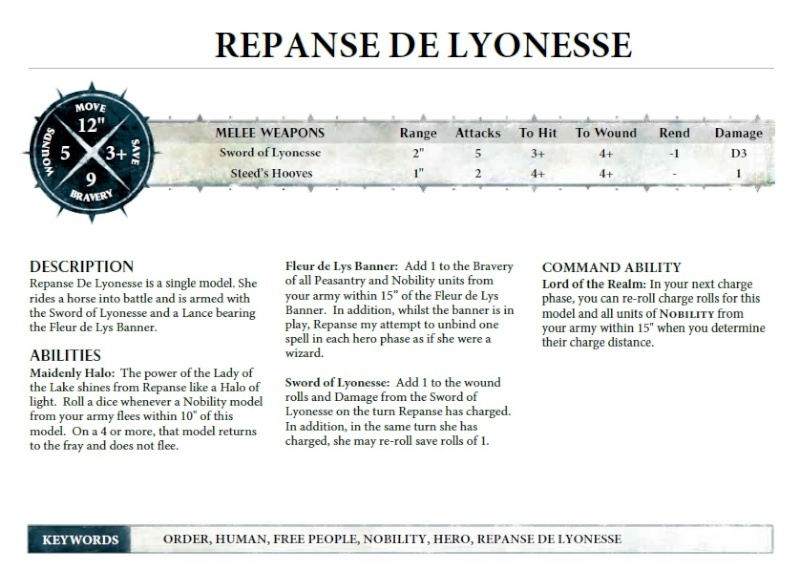 Sword of Lyonesse: Add 1 to the wound rolls and Damage from the Sword of Lyonesse on the turn she has charged. In addition, in the same turn she has charged, Repanse may re-roll save rolls of 1. Looking back, essentially I have merged a Bretonnian lord together with half the Grail Banner from the Paladin with a Relic bearer rule that's taken from the basic archer or men-at-arm units. I would say that Repanse seems slightly strong. Can cause up to 20 wounds on the turn she charges. Other than that it's really cool and about time Bretonians got some love, well done. Planning on any other units? I do indeed have plans for other characters. I know these will never be official, and I know some people might not like playing them, because it's not printed from GW... but I enjoy bringing back the love to past characters. Was just the "essentially I have merged a Paladin and Bretonnian lord" that made me think it may have gone a little too far. Best of both sort of thing. Will happily help play test the rules you put together when your done! "Looking back, essentially I have merged a Bretonnian lord together half the Grail Banner from the Paladin with a Relic bearer rule that's taken from the basic archer or men-at-arm units." And thanks dude, that would be awesome. I hope that from the rules she had people can see what I'm trying to achieve. I made a pledge not to make up my own rules but to use existing ones available to me in the Bretonnian Warscrolls. Still torn as to whether or not she should have a 2" or a 1" range. The sword is the focus but she does have a lance that the banner is attached to. Could always modify the swords special rule to have increased range when charging. They generally say something like Lance and Blade in the profile. Squires is another unit I would love to see again.